Here’s the barrel pivot, it doesnt look like much yet but its nice and accurate and strong. It’s also spring loaded so when the actor flips the barrel lock the barrels will spring open allowing him to reload. The pivot hinge is built onto the main aluminium part which holds the triggers, grip and barrel lock. The black piece is acrylic fixed to aluminium strips which make up body of the the hinge. There’s a spring above the hinge set into drilled channels and the hinge is shaped to stop at about 35-40 degrees off horizontal. This brings the barrels up nice and high for reloading whilst not so far as to look silly. Now I have all the mechanics completed, I plan to start fleshing the thing out. 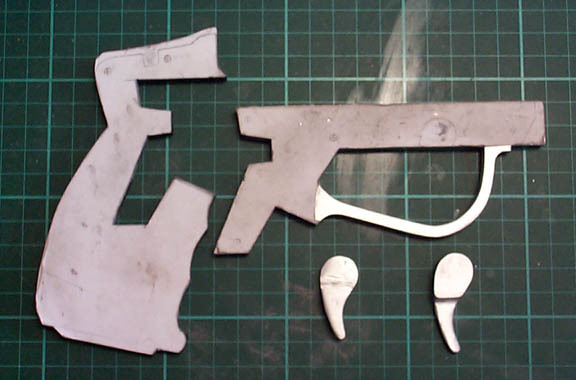 This is the part where it starts to look like a gun instead if a bunch of parts, so it should begin to get interesting. 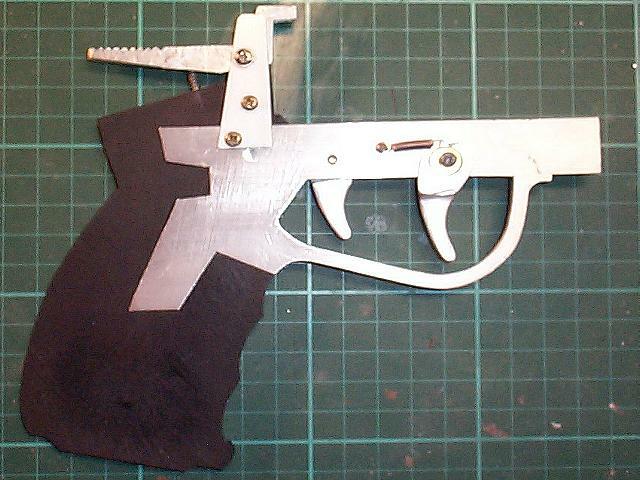 The trigger and barrel lock mechanisms are in place. All of this is aluminium for extra strength. Each part is spring loaded for good positive returns. Also, I want them to be repairable and replaceable so I’ve tapped threads where possible. All this takes a bit more time and effort than I’d like, but I think it’ll be worth it in the end. 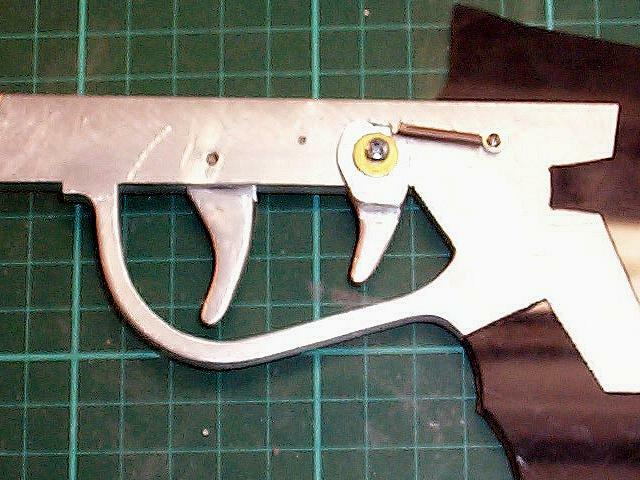 A left side shot of the small trigger spring mechanism. It’s a very simple and gives 4-5mm travel, subtle but it will add realism during filming. The Barrel locking lever. This is again spring loaded, it will grab onto the top part of the barrel when flipped back after loading. it needs to have a good amount of grab so the barrels don’t accidentally flip open when the gun is waved about. I’ll tweak the shape of the grabbing “tooth” once I have the barrel pivot built and the barrels fitted. I’m thinking about making the barrel pivot itself spring loaded so that it flips open when the lock lever is pressed, if it’s doable it should look pretty cool. The triggers are now made as is the inner part of the grip. I’m happy to have the aluminium parts done. They take twice as long as acrylic to shape and get very hot when using grinding/shaping bits on them, meaning I have to drop them in a bowl of water every so often. With them out the way I can focus on the grip parts and get the barrel lock and pivot built, then it should be a case of bringing it all together and doing the aesthetics. I’m planning to build with screws and fixings wherever possible and try to keep the glue to a minimum so the whole thing can be disassembled/reassembled later (in case repairs or modifications are needed). 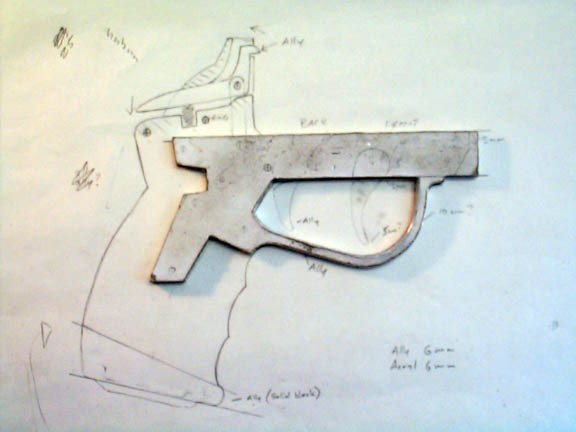 Ive been working on the main internal part (I’m calling it the trigger piece) of the pistol. Ive built this from 6mm aluminium both for strength and because I want the trigger guard to be real silver coloured metal. The pistol needs to be quite rigid around this area for a few reasons; this part has the barrel pivot mechanism attached and I’d like the actor to be able to flip open the barrels with a wrist flick. Also the barrel lock will be attached to this piece and that needs to be a good positive lock. 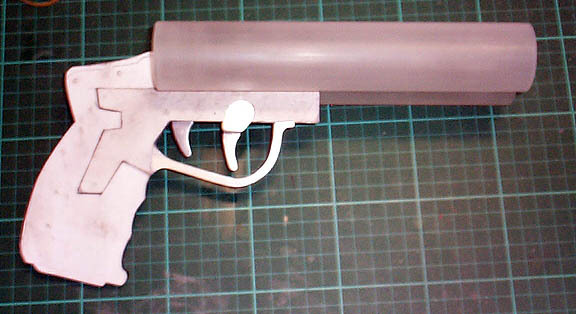 In addition, the trigger piece holds the trigger mechanisms and is also the main bit connecting the grip to the barrels. So it needs to be sturdy. Its a pretty good copy from my drawing. 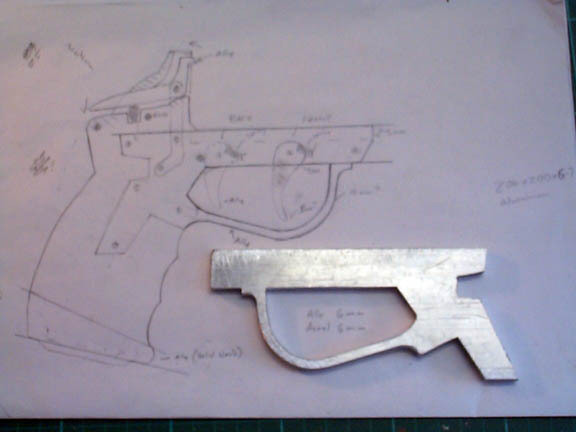 I make a copy of my drawing then spray-glue that to the 6mm ally stock and start shaping: First with scroll saw, then handsaw for the tight bits, then clean it up with files, grinder and dremmel, then wet and dry it to a manufactured looking finish. I’m glad its only aluminium and not steel, final shaping with needle files is a real chore after the first hour. 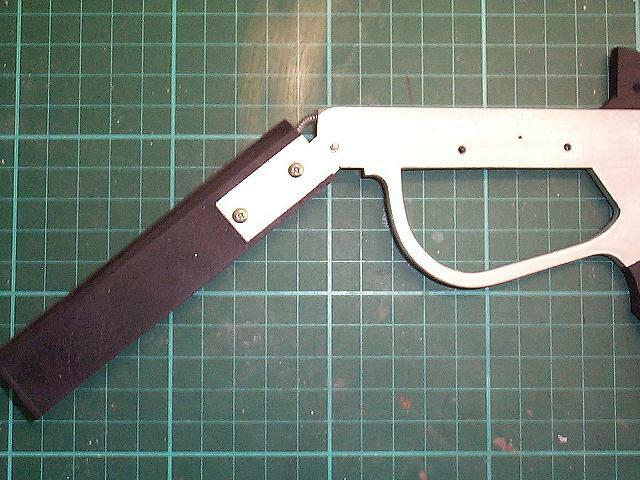 From here, I can begin to build the grip area, triggers and the barrel pivot and lock. I think I’ll shape the triggers first (which will be ally) meaning the major metal shaping parts will be out the way, phew.